Do you have a musty mildew smell in your house, or have you had a flood and after the water is cleaned up you are left with a musty mildew odor? Earth Care's Clear The Air Odor Eliminator will completely eliminate these odors. 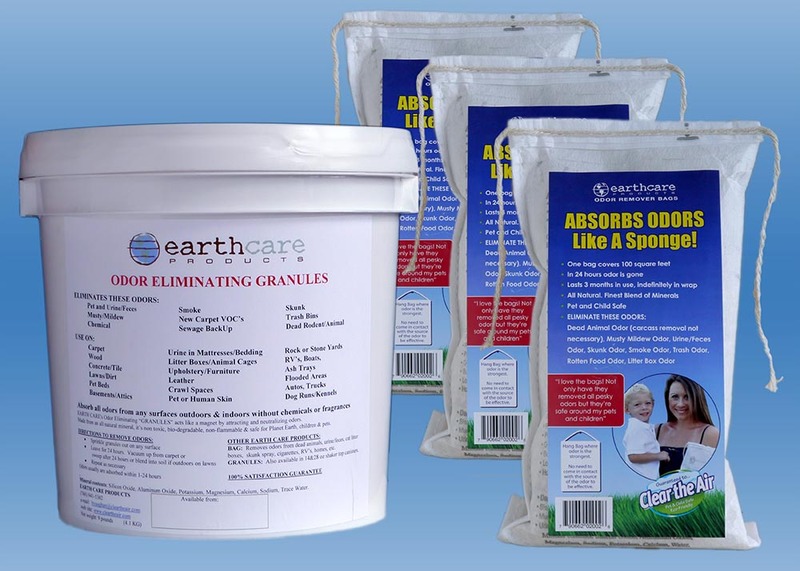 Simple and cost effective to use Earth Care is the answer to your basements musty mildew odors. This unique form of Earth Care Products Mineral does not have to come into contact with the odor producer; it will pull the odors from the entire area. Clear The Air draws in musty odors like a powerful magnet. The odors are absorbed, and neutralized without any fragrances. Clear The Air does not cover up odors; it literally "clears the air" leaving the air fresh and clean. Clear The Air is made from an all natural mineral, is non toxic and biodegradable and safe for Planet Earth. Hang 1-3 bags in basement. One bag will cover up to 100 square feet. Bags will continue to eliminate musty odors for up to 3 months. Sprinkle Clear The Air Odor Eliminator Granules on floor, leave down 24 hours and sweep or vacuum. Odors will be completely eliminated. One Bucket of Clear The Air Odor Eliminator granules covers approximately 900 square feet. Click Here to learn more about removing musty odors from your home. We used your product in our basement for the pet and other odors and only 24 hours later, the smell was completely gone. All we could smell was fresh air. Your product works GREAT! Thanks!